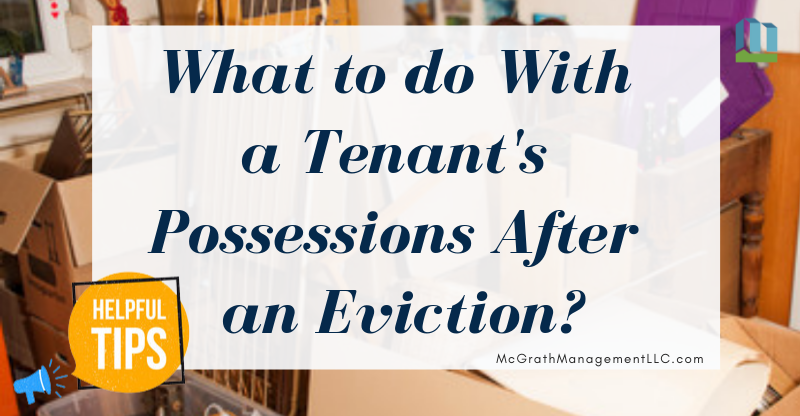 What to do With a Tenant’s Possessions After an Eviction? Evictions are never easy, but it is a necessary part of property management. It’s never simple to settle on the choice to drive an individual from their home, however, there are conditions in which a tenure ends up untenable and landlords are forced to seek legal action to regain possession of a unit. One question has come up frequently concerning the eviction process: What does one do with a tenant’s possessions? In the case of legal possession, the marshal takes an inventory of all items inside the premises and the landlord signs a statement releasing the marshal of all liability regarding the possessions and the landlord accepts accountability for the tenant’s possessions and can be held liable if the possessions are damaged, stolen, or lost. This is true whether you keep the items in the unit until the tenant comes to get them or if you have them moved to either an on-site or off-site storage facility. Furthermore, you are required to watch and make sure these items are safe for an unspecified period of time unless there is language in your lease that explicitly provides a specific amount of time for which you are in charge of the tenant’s possessions. There is no law stating that landlords only need to keep the tenants’ possessions for thirty days. Then again, there have been cases in which judgments have been entered against landlords who have disposed of tenants’ possessions after holding onto them for what the landlord felt was a reasonable amount of time. And unfortunately, there is no guarantee that you will recover the costs you incurred when you moved and put these items into storage. It is totally possible that the tenant will just abandon them and leave you paying the bill. You do not only take into consideration what type of eviction you should pursue, but you should also take into account the importance of requesting a marshal with experience and the requisite skills to make sure the eviction is taken care of without any hiccups.